With the other Wheelsport Fantasy mini velo also converted to a 2x10 speed drop bar set up, it is now the perfect chance to compare it with my own matte black Wheelsport Fantasy mini velo. The wheelbase will of course be the same, since it is the same frame, but other geometries such as the handlebar reach will be different. Pair of Wheelsport Fantasy mini velos! Also, my matte black bike has a shorter handlepost, which also gives a more aggressive riding posture. The stem on the other bike cannot be lowered any further due to limitation of the folding handlepost design. Even closer view at the reach of the two bikes. My bike with the Ultegra Di2 shifters has a lower and further reach. Time to finish up the other bike with a good bar tape! I like Lizard Skins bar tape as it is super comfortable, and can be rewrapped many times without getting sticky. Ta-da! Fresh bar tape on the Wheelsport Fantasy 2x10 speed drop bar mini velo. Equipped with Tiagra 4700 2x10 speed road shifters, which has the same good shifting ergonomics and feeling of the new generation Dura-Ace/Ultegra/105 shifters. With this conversion from flat handlebar to drop bar setup, it is easier to achieve a higher cruising speed as the more aggressive riding posture allows good power transfer to the pedals, and also puts the rider lower down for less air resistance. 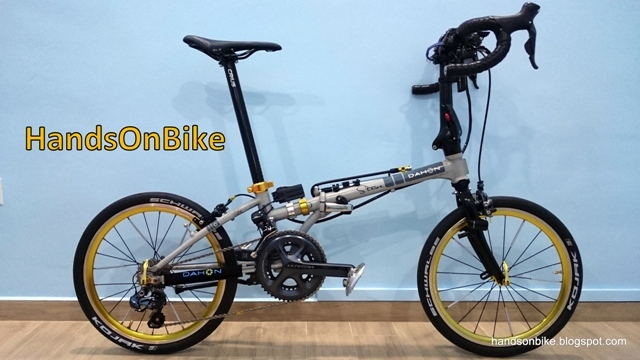 We have tried riding our Wheelsport Fantasy mini velos with a group of road bikes at a rolling speed of about 32-35km/h, and this Wheelsport Fantasy mini velo is able to keep up, although it does take more effort compared to a full sized road bike. The setup on these two Wheelsport Fantasy mini velos are as good as it gets if you want to ride fast on a mini velo. Going to more high end components will not improve your speed any further as these components are not the limiting factor. hello what is the total cost of the bike? I have couple of questions, hope you can enlighten me. 1. Wife is using Tern Link P9 (9 speed with Neos 3.0). Facing chain drop issues on gear 3-4, so I was thinking about upgrading it to 105 10 speed. Would Tiagra SL-4700 trigger shifter be compatible? 2. 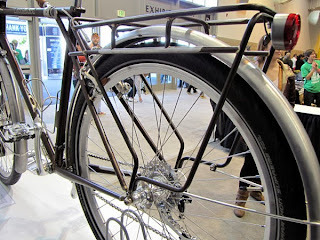 I’m on Tern Link D16, thinking about converting to dropbar as I am facing shoulder and wrist aches when cycling. As such conversion will require lots of parts replacement, would the conversion be of any use? 1) Tiagra SL-4700 must match with Tiagra RD-4700, not Tiagra 4600 or 105 5700 or 105 5800. You will need to get an RD mount for the Link P9. 2) Changing to drop bar will help prevent wrist pain, as the holding of the road shifters is more ergonomic than holding a flat handlebar. Changing to dropbar meant handle post and cockpit, plus drive train mods. If I purchase the individual components online, will there be any LBS that can carry out the labour for me? If there's any LBS that carries all the components and include labour, I wouldn't mind paying a little more. You can try The Bike Settlement. They should have all the parts that you need for the upgrade. Look for Kelvin.